Combine flour and coconut in a large bowl. Whisk egg, coconut milk, skim milk and sugar in a jug. Stir into flour mixture. Set aside for 30 mins to rest. Heat a medium non-stick frying pan over medium-low heat. Lightly brush with melted butter. Pour 1/4 cup (60ml) batter into the pan. Cook for 2 mins or until bubbles appear on the surface. Carefully turn and cook for 1 min or until golden. Transfer to a plate and cover with foil to keep warm. Repeat with remaining mixture to make 12 pancakes. 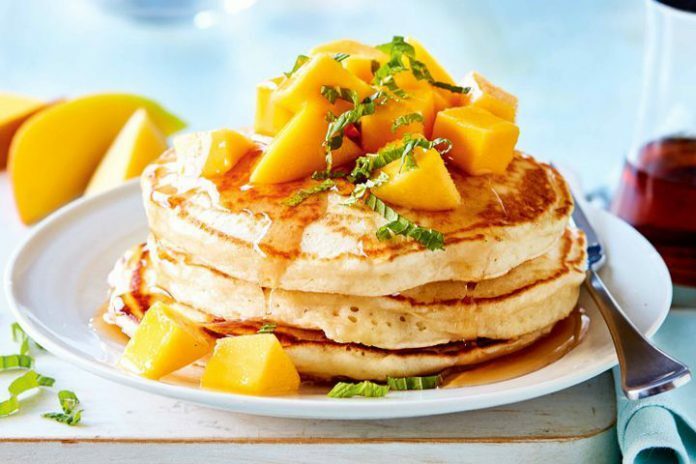 Stack the pancakes on serving plates. Top with mango.